Can We Talk? The pursuit of beauty has created an ever widening divorce between the physical and spiritual. Is beauty truly only in the eye of the beholder or can something be beautiful regardless of our opinion? Truth, goodness and beauty are referred to as transcendental because they transcend the limits of the places or times in which we live. Each of these are rooted in “being” and are not contingent upon what religious beliefs you have or what culture you come from or what ideology you adhere to. In fact, Truth, Goodness and Beauty are objective properties that that can be found in all creation. So how can a person be so blind to the truth that they do harm and not good to themselves all for the sake of trying to become what they already are which is beautiful? I believe it is because of the divorce that has taken place between the spiritual and physical realm. The body makes visible the invisible reality of the person we see before us. We are not just a material substance that can be nipped and tucked and implanted so as to “become” beautiful but rather we are a union of spirit and matter. We are “embodied spirits” and our beauty exists whether we acknowledge it or not. If the body makes visible the invisible than we understand that someone who modifies their bodies with piercings and tattoos has a spirit screaming to be seen and heard or is in fact could be so shattered that the modifications become a shield or costume to hide behind so that others will not truly “see” them. What was Joan Rivers soul making visible to the world? We know that she has had hundreds of plastic surgery procedures and has suffered with bulimia as well. This is a serious identity issue that many women are struggling with and it starts with truth. Our truth is being warped and manipulated into something very ugly. It leads people to mutilate and abuse themselves until goodness is out of reach and beauty is unattainable. For Joan, I would postulate that her truth was skewed. I would also postulate that she was deeply dissatisfied with herself and was a woman that desperately needed to hear that she was a unique and unrepeatable person made in the image and likeness of God and that her personhood was good. Let’s us pray for the world to rediscover the true, the good and beautiful because ultimately that will lead us all to what we have been destined for. Eternal Rest Grant Unto Her Oh Lord and Let Perpetual Light Shine Upon Her and May She Rest In Peace. At first I thought going to a memorial service to say good-bye to Kolbe (the baby I just lost in miscarriage) was that last thing I would do. The thought of making myself emotionally vulnerable and go back into the wound that I just wanted to walk away from was the least appealing idea to me. Yet, when the priest at my Church texted to tell me that the cemetery that Kolbe was to be buried at had a memorial service being offered the very next week after losing my baby, it seemed to be an invitation from God. Either that or it was very coincidental that within a week of miscarrying there was a service being offered. Then he told me that the day it was offered was the very day we had a meeting scheduled anyways so he knew I would be free. I have begun to see these kind of coincidences as ways in which God is gently nudging me in a particular direction. They are painful nudges, but they are invitations that I have begun to understand as doors God the Father desires for me, His daughter to walk through because He want to take me deeper, closer and farther in my spiritual walk towards Him. Even now I am having a hard time articulating the intense fear and reservation that still accompanies his invitations. That invitation in Florida, the one that opened my eyes to see that I am always being invited, changed my life. I call it my undoing because I was undone, but then I was made new. I heard the invitation to walk into the loss of this baby when it would be so much easier to just continue marching forward and get on with my life. It is so easy to do with all of the things on my calendar. I could easily slip away from it all and just try to forget. Yet, here I was standing in a cemetery listening to poems being read out loud by other women who just lost their babies. 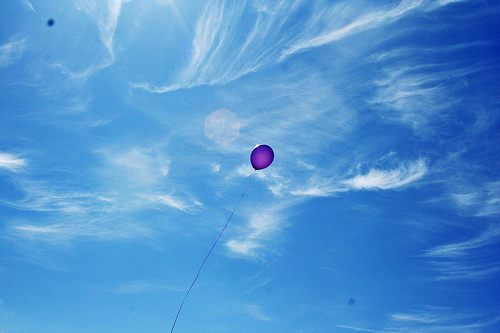 The most beautiful part of the ceremony was the moment the woman there handed me a purple balloon in honor of Kolbe. As it was placed in my hands the tears slipped out of my eyes and down my face. To hold something in my hands that was for Kolbe broke open the stones I had tried to put around the wound in my heart to keep from feeling the loss. One of my most favorite songs ever started playing as we were invited to say goodbye in our own private way. I watched a mother and three children each take a balloon and tie a note to the string. They released their balloons together and I watched as she kneeled on the ground holding her children and watching with them as the balloons rose in the air carrying their little notes with them. Looking back at my own balloon I closed my eyes for a brief moment and I swear I saw Kolbe holding hands with his siblings in heaven, laughing and running chasing after the balloons like children do. Then I did what I must always do when I am going to accept an invitation sent to me from God my Father. I let go. When I woke up today, I did not know I was going to hold a dying womans body in my arms. 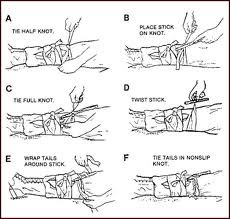 I did not know I would have to push through skin, muscle and fat tissue to tie a turnacut around her leg which was nearly severed from her body. As usual, I had my day’s wrong in my mind and thought I was heading to our parish picnic where I had signed up myself and two of my teen age daugthers for face painting. As I turned down Northland Avenue, an ambulance pulled into the intersection so I turned the radio off and my daughters and I prayed a Hail Mary for the person who was in need and that the driver would get there safe and soon, Amen. Little did I know that I would soon see another ambulance, this time to the scene of an accident I would be at. “I don’t think so, I am sure that is not what you saw”. Wondering what it was that she did see, I turned the car around and pulled into the main driveway. Sure enough, there was a woman under a car near a light pole and several people were standing around her. All of them seemed to be in a daze. At first I thought, I don’t want to be in the way, maybe I should not go over. But then I saw that other than a woman holding the victims hand and another holding her head, it did not appear anyone knew what to do. “Is there anyone here that has more training than me? I know CPR, I have had some first aid training?” As I looked around they all shook their heads and stared blankly, just as scared as I was we all could see the the blood forming a large pool around her. As it poured out of this little woman the pool began to grow larger and so I knew I had to do something and I had to do it fast. I yelled for someone to call an ambulance and then I yelled for them to get Fr. Tom outside NOW! I kneeled down next to her and she was praying the Hail Mary, over and over in a whisper. A friend of hers, Toni, was there praying a rosary out loud and I could hear the woman praying softly with her. I too began to pray. I now looked more closely at her injuries and saw that the bone had not only been broken and twisted completely around, but it had been pulled through the body and her entire upper thigh was ripped open. The tissues and bone were all exposed and the blood was spurting out all over. Out of no where, an image that I remembered from college popped into my mind. It was a black and white photo from a first-aid manual of a turnacut. I realized she needed a turnacut but was not sure how I would get it around this mutilated leg or even where I would get something to tie around her. I yelled for someone to get me material or a belt, I needed a turnacut. Three people ripped off their belts and thrust them at me, I have never been so grateful to have someone hand me a belt in all of my life. I then realized I was going to have to pull through the muscle and fat tissues and lift them out of the way to find my way around the leg. After several failed attempts, I realized if I did not do this, she would bleed to death if she was not already at the verge of being left with little to no blood. I yelled for someone to go and get Father Tom. “She needs a priest! Someone get Father!” I yelled out. I saw him emerge from the church doors looking confused and then in horror and shock at what he was trying to understand what he was looking at. One of his parishioners, a woman who sought him out after every mass to kiss his hands and thank him for bringing her Jesus, was lying under a car, in a pool of blood. Not more than 5 minutes earlier, she had been smiling up at him. It was as if he immediately understood without me having to explain. I saw on his face that he understood the gravity of the situation. I knew in that moment, the most important thing I could do for her that day would be to bring a priest to her side and give her last rites so as to make her ready to meet Jesus. His face turned white as a sheet and then, as if he was given an instruction internally, he turned on his heel and went back into the church. Oh no, I thought, he isn’t coming. “Where is he going?” I said outloud. Someone I am not sure, perhaps Toni, who remained at Paz’s side the entire time, said to me “He is going to get the Holy Oil”. I must have been in shock, because I did not even think of that, even though that is why I called for him. The next thing I know he was back with the holy oil and was praying over her and giving her the blessing of the church and absolving her of her sins. He must have ran the whole way because he was by my side faster than I had ever in my life seen someone move. At this time, Paz had stopped praying and looked so very afraid. Her eyes where very wide and her mouth was open as she looked into my eyes. I quickly prayed for the strength to do what needed to be done and I felt an interior voice say…just focus on her. I lifted up the flesh and put my hands into her body and felt around to the other side and then quickly slid the belt along the route I had just determined I could get to as my fingers kept the skin back to give the belt passage. I secured it and then pulled with all of my might, knowing it would need to be tight, but so very afraid I would hurt her. I watched her face as I did this to see if there was any reaction of pain, but there was none, only confusion and fear. That is when I knew that the words I would speak to her would perhaps be the last she would hear on this earth. What would they be? I leaned over to the woman and told her not to be afraid. I reminded her she just received the blessed sacrament. I told her she had been given last rites and that we were praying the Rosary with her. I saw her look at me and I told her that Mary will hold her in her arms and Jesus was with her. I told her she was in a state of grace, she was wearing her scapular and she was ready. I told her to trust in Jesus, to place herself in Marys arms over and over. I desired to give her peace and to take away any and all fear, but let her know to trust in God, trust in Him. Her eyes softened and it was as if all the fear and confusion melted away. As soon as I said this, her breathing changed, first she stopped breathing, then she began to gasp and gulp. The paramedics arrived. I yelled to them and to the woman who was helping me telling them she stopped breathing. The woman helping me confirmed indeed, she was dying. I saw the blood flow slow down, but I saw the spurts continue with a pulsing rhythm. A woman, an anesthesiologist was helping. She told me I had to apply pressure at the groin. The turnacut was not enough so I had to use my hands to grip her flesh directly to try and stop the bleeding. I reached in and held the skin and tissues with my hands as tight as I could. The spurts stopped. When I realized all I could do was done and a paramedic stepped in and was working on her breathing, I let go of her leg and stepped back. Her blood covering my hands and arms, pooled in my shoe and on my knees from where I had been kneeling before her. I slowly stepped away from her. It was hard, because I saw her go from praying and looking at me, to dying in front of me. As I went into the parish bathroom and washed the blood off of my hands, I saw bits and pieces of her on me, I realized that I had the blood of a possible saint on me. She had come from Mass, she was a regular attendee and Eucharist Adoration visitor, she was wearing a scapular, had gone to confession (I found out later she attended Divine Mercy Sunday services and this is the remittance of all temporal consequence for sin) and she had been given last rites and anointing and so I may assume based on her faith and love of God, that she was with Jesus in Heaven as I washed her body from my hands. I prayed for her and thought, was this a loving mercy from God? I have always prayed that when I die, I would be in a state of grace, I would have been to confession, would have just received communion, would have a priest there to give me last rites, that those around me would be praying a rosary or speaking to me about trust in God and to not be afraid and here she was given all of these things. At 95 years of age, she lived a beautiful long life. I found out she also had all her faculties and was considered by many woman a beautiful and holy soul that inspired them to live their own faith. 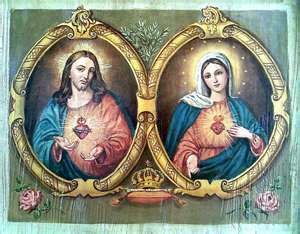 She had a special devotion to the Sacred Heart of Jesus and shared this prayer with others. She had been an OB/GYN had a love for the unborn and here she laid, not more than 3 or 4 feet from the memmorial to the unborn. She was surrounded by flowers and people praying the rosary for her and with her. I met a woman named Tony who told me these things and also how much she prayed and offered up suffering for her own son to come back to the sacraments. I offered my next mass for this and later, offered my communion at her funeral mass for him to be reunited to the church and the sacraments. I ended up singing the Ave Maria at her funeral. How fitting since it was the prayer we had said together as she approached the throne of God. Was this all just a coincidence? Was it a coincidence that I got the day wrong and drove by just at the time this happened? Was it a coincidence my daughter saw it as I was about to just drive by? Was it a coincidence that I heard her praying and yelled for the group to pray with her? Was it a coincidence that I had an image of a priest giving last rites flash into my mind so that I would have the presence of mind to think to call for a priest? Was it a coincidence that when he came out and heard me, he was able to subvert his natural inclination to run to the aid of an injured woman and instead of acting on it he ran into the church to obtain the holy oil in which to give her Extreme Unction? Was is a coincidence that her death occurred within minutes of the accident, minimizing suffering, but enough time to allow for a priest to come and for the sacrament to be given while she was still alive? I think not. I think it was a gift. I think it was divine providence. How can a tragedy be a gift? Because her death, although it still haunts me, was the way I would want to die. For those of you who believe in heaven, then you realize what an amazing blessing it was that the hour of her death was 15 minutes of union with Jesus in the Blessed Sacrament, followed by 15 minutes of suffering, surrounded by people in prayer and a priest anointing her and comforting her. 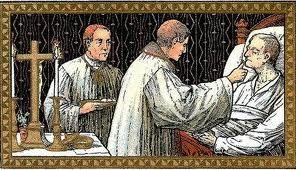 The prior 30 minutes was the Holy Sacrifice of the Mass. For me, that would be a blessing. I pray her family sees it that way. Eternal Rest Grant unto her O Lord and let perpetual light shine upon her and may she rest in peace, most sacred heart of Jesus, Have Mercy On Us. Paz Guidote, 95, a native of the Philippines, came to the United States in 1964 where she built a career as an obstetrics and gynecology physician. She retired from her job in St. Paul, Minn., at age 78. While she was in her 20s, Guidote served as a first lieutenant in the Philippine Army, as part of the Philippine resistance to the Japanese. 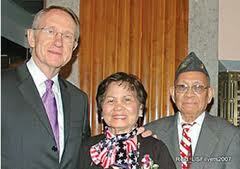 Paz Guidote in 2009 told The Post-Crescent she treated several American soldiers who escaped from the infamous Bataan Death March, which was the forcible transfer of 75,000 American and Filipino prisoners of war from the Bataan peninsula prison camps. In 2009, Paz Guidote talked of her family’s role in the war. Family members used a transmitter to send messages reporting Japanese army, navy and air force strength and troop movements to U.S. military bases in the Pacific Theater of Operations. A Japanese soldier came to their home and it provided a close call. Her sister, though, stepped to the piano and provided significant enough distraction to keep him from the bedroom the transmitter was located. She, too, made note of her love of country. “I’m proud that we survived and helped the Americans,” she said.